The industry was buoyed by increased recreation spending and lodging sales. 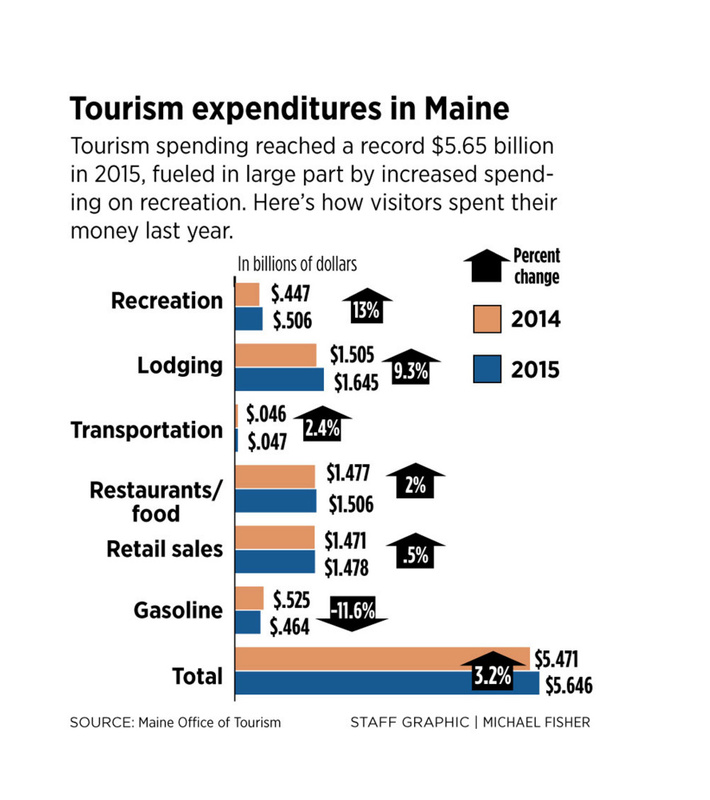 A double-digit increase in recreation spending helped boost overall tourism revenue in Maine to a record $5.65 billion in 2015. The Maine Office of Tourism presented data at an annual conference at Sunday River Ski Resort in Newry on Tuesday that show direct tourism spending increased by 3.2 percent from $5.47 billion in 2014. The calculations were made by DPA Inc., a digital research firm in Kennebunk. • Economic impact, which includes direct and indirect spending, totaled $8.29 billion last year, compared with $7.95 billion in 2014 for a 4.3 percent increase. • State tax revenue from tourism spending increased 4 percent, from $533.2 million to $554.7 million. • Jobs supported by tourism increased from 94,118 to 98,932, a 5.1 percent hike. The 2015 figure represents about 15 percent of all employment in the state. The greatest increase in direct tourism spending occurred in recreation, which went from $447.5 million in 2014 to $505.7 million last year – a 13 percent jump. A portion of the increase may be attributable to changes in the way DPA surveyed tourists to arrive at its 2015 figures. Calls to tourism officials for an explanation weren’t returned. Steve Jermanok, a travel writer and business owner who led a session on adventure travel at Tuesday’s conference, said the demand for travel packages built around outdoor recreation activities such as winter sports, hiking and water sports has taken off in the past decade. Part of that increase has been driven by baby boomers, he said. At last year’s annual conference, a segment of visitors called “genuine originals” was identified as highly desirable tourists to attract to Maine. They have higher average household incomes, about $131,000, and are looking for more authentic vacation experiences and seek more adventurous outdoor recreation. The increase in recreation spending helped offset an 11.6 percent drop in spending on gasoline, the result of cheaper gas prices. Total visitation to the state increased by 2.9 percent, from 32.9 million visits in 2014 to 33.9 million visits in 2015, according to the tourism office. Those additional visits were reflected in healthy lodging sales, which rose from $1.51 billion in 2014 to $1.65 billion last year, an increase of 9.3 percent. Carolann Ouellette, director of the tourism office, said her agency has expanded its marketing efforts in several ways to draw visitors to Maine. It now employs a broad-based strategy that includes traditional advertising and “native placements,” paid advertising in print or online publications that resembles journalistic content. Such placements have appeared in various travel publications and even major news outlets, including Newsweek. The office also has used long-form writing in its own quarterly publication, The Maine Thing Quarterly, to tell stories of Maine visitors and their travels, and to paint vibrant images of travel destinations within the state. 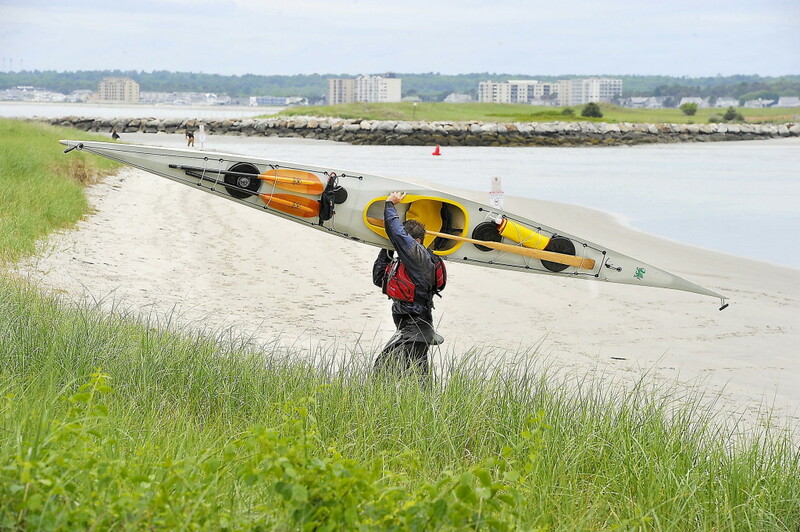 “Destination development is definitely key to expanding Maine’s tourism industry,” Ouellette told a crowd of roughly 400 travel industry professionals at the conference. She said the office also plans to engage potential visitors through social media and line up celebrity endorsements in the coming year. The tourism office on Tuesday released its marketing plan for 2016, which includes a goal of surpassing 5 million total visits by first-time travelers to Maine. First-time visitation in 2015 was about 4.5 million visits. In addition to continued advertising on radio and TV stations, in magazines and on the Internet, the office said it also plans to expand strategic partnerships with groups including the Maine Film Office, Maine Arts Commission and tourism organizations in Canada. Canadian visitation to Maine dipped slightly from 4.2 million visits in 2014 to 4.1 million visits in 2015. Direct spending by Canadian visitors fell 22 percent from $1.1 billion to $856 million during the same period. Still, Canadian visitors were responsible for one-fifth of all tourism-related retail spending in Maine in 2015, the office said. It outlined a strategy that involves additional research to determine how to lure more Canadians, to offset the drop in visitation caused in large part by a significant drop in the Canadian dollar’s value relative to U.S. currency.